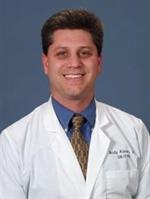 Directory > OBGYN > FL > Clermont > Andrew Karen, M.D. Dr. Andrew Karen is board certified in obstetrics and gynecology. He belongs to the Florida Medical Society and the American College of Obstetrics and Gynecology. Dr. Karen graduated from Stony Brook University in Stony Brook, New York with a Bachelors of Science in Biology in 1994. He received his medical degree from Ross University School of Medicine in 1999. During his residency in Pittsburgh, Pennsylvania, he received extensive training in gynecologic oncology, high-risk obstetrics and advanced laparoscopic surgery. In his final year of residency, he served as Chief Resident and also received The Golden Hands Award. In 2003, he began working in a private practice in Morristown, New Jersey, where he specialized in obstetrics and gynecology. Dr. Karen is a second generation physician; his father is a plastic surgeon residing in Jupiter, Florida. He enjoys participating in tennis, skiing and bicycling as well as traveling, reading and spending time with his family. He resides in South Lake County with his wife, Victoria, and two children, Matthew and Adam. Dr. Karen is dedicated to bringing the highest standards of care to women. He has particular interest and expertise in minimally invasive laparoscopic surgery as well as endometrial ablation to stop heavy periods. His new office is located in the Womens Center at South Lake Hospital. Services Andrew Karen, M.D. offers OBGYN services in Clermont, FL at 1900 Don Wickham Dr Suite 110, Clermont, FL 34711. Obstetricians & Gynecologists (OBGYN) specialize in female reproductive health issues as well as gynecological health issues. To learn more about OBGYN services, or to make an appointment with Andrew Karen, M.D. in Clermont, FL, please call (352) 536-8800. Does this OBGYN answer your questions so you fully understand?